A great pioneer of multihull voyaging, James Wharram sailed from Las Palmas toward Trinidad two days before Christmas 1955. His crew consisted of two girls, Ruth and Jutta, and Pepe the dog. His boat was the 23ft catamaran Tangaroa, which he had designed and built himself. Against advice from most of the pundits of the day, he held true to those same beliefs he holds to this day, after putting them well and truly on the line across the oceans of the world. His work has opened long-range voyaging to many who would never have made the leap into the unknown without his inspiring example. 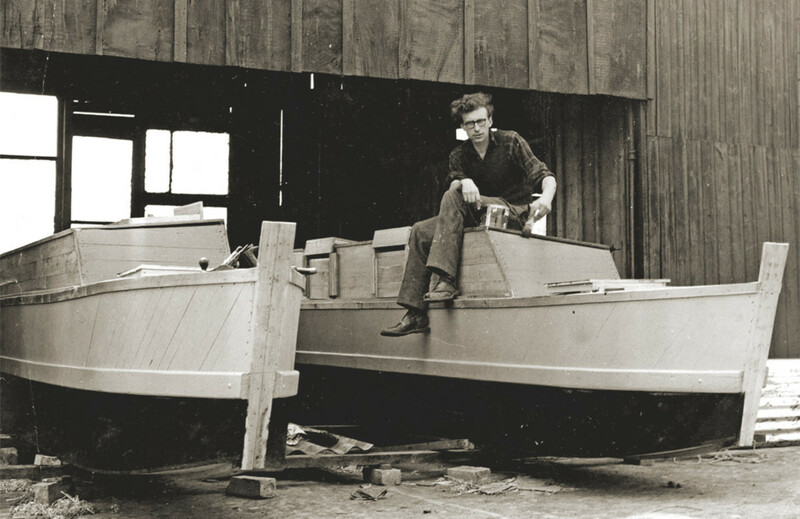 Following the philosophies of the traditional seafarers of the Pacific, Tangaroa’s tiny plywood hulls were connected by flexible mounted beams and an open slatted platform. It is impossible to conceive of a vessel further removed from today’s high-tech race boats. 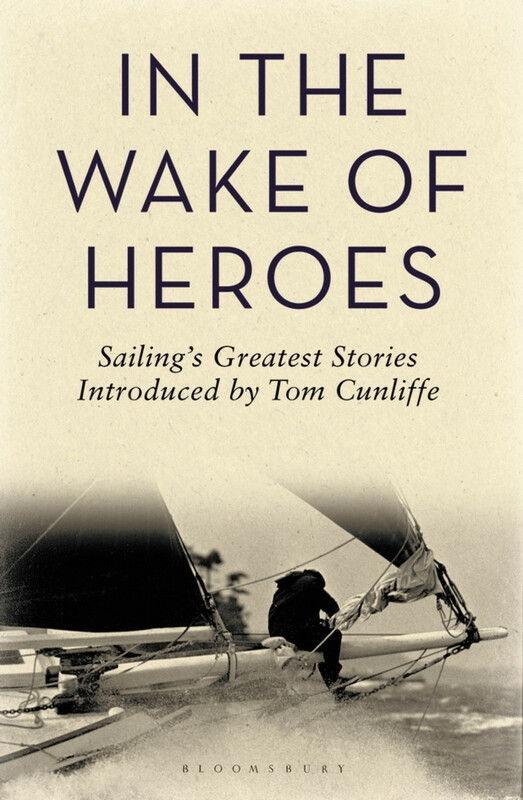 Wharram’s first book, Two Girls, Two Catamarans, has a charm that has stood the test of time, writes Tom Cunliffe. The longed-for easterlies arrived on Christmas Day. Despite unexpected cold, hard winds and big seas, Wharram and the girls set up a modest pair of twin spinnakers and led the sheets to the tiller in an effective self-steering arrangement. All went well until the New Year. Tangaroa’s deck was littered with boxes of vegetables, spare sails, oars, but finding a spot by the mast, I braced myself against it, and as I ate my breakfast, watched Tangaroa rise endlessly over the steep seas. A cliff face of water would advance, crested white with foam. It seemed impossible to rise over it, but at the last minute, Tangaroa’s stern would lift. Leaning my head back, I looked up at the wind-filled spinnakers bending the mast. My eyes followed the controlling ropes from the boom ends leading to the rudders, which constantly moved, correcting Tangaroa’s course. The knot of anxiety and discomfort, because of the weather of the previous days, began to dissolve in the sun and beauty of the scene; then, suddenly, it was all over. The port spinnaker and boom shot forward, flapping wildly as it lost the wind. The full starboard spinnaker dragged the rudder over, and Tangaroa was beam-on to the waves. Whoomph! The first crest slammed in and sprayed like a fire hose across the deck. Then another came and another. The shocked girls scrambled out of the cabins. My first thought was that the sheet had snapped, but when I crawled to the stern, I saw the port rudder at right angles to the boat “fishtailing” through the water. The 6ft deep rudders, constantly moving under the strain, had caused the long rod to crystallize and to snap. Stripping my wet clothes off, I crawled to the stern. Jutta steered with the remaining rudder as Ruth passed the loose one forward over my head and then gave me the four-foot long spare rod to slide into position. Lining up the rudder hinge holes with the hinge holes fitted to the stern was a back-breaking struggle. The stern, weighed down by Ruth and me, was swept by the seas. In between, I could get it lined up and have the rod ready to drop in, but the next wave would wrench the rudder out of my hands. Fortunately, we had tied the rudder on a safety line. Gulping for air in between the body-submerging waves, I actually had the rudder rod half in position, when a wave battered the whole boat. “Your hands!” Ruth shouted above the wind. They were streaming with blood where they had got pinched between the fittings. “Give up, Jimmy! Give up till the sea goes down. I can steer,” cried Jutta. Dragging the rudder and the long rod, I crawled back into the security of the deck, then dropped into the cabin utterly exhausted. Pepe nuzzled up to me, giving my face a lick as if to say: “It will be all right.” But I could not rest. My whole body lay aware of the movement of the boat and the sea. In the late afternoon, I felt a lull. This time, I sat on the stern, my feet dangling in the sea. I slid the rudder blade down between them, getting a firm hold over the lower end. Over my shoulder it came. In between the sweeping waves, I guided it in. I had succeeded. Tangaroa had two rudders again. It was too rough to hoist both spinnakers for self-steering. Throughout the night, each one of us would sit damp and shivering on the steering position at the stern for one-and-a-half to two hours before stripping off our wet clothes and dropping naked into the cabins. At least we kept our bunks moderately dry and warm. Pepe made a splendid hot-water bottle. He, of the whole crew, seemed the least affected by the hardships, but then he came from a long line of Spanish seadogs. By the morning of the second day of January, we had enough confidence to hoist the twin spinnakers again. Relieved of steering, I slumped in my position at the foot of the mainmast watching the clouds overhead sailing by. In a half exhausted doze, I had my eyes fixed on the head of the mizzen mast, which was swaying, not in time with the boat, but in some dizzy dance of its own. I leapt up and pushed my shoulder against it to hold it up before it crashed onto the deck. Once more, it was “all hands on deck.” Struggling and cursing, we lowered it. The mizzen mast was held up by wires which ran up one side of it, looped round the head and ran down the other side to the deck. The loop was held together by a rope lashing—a time-honored method of rigging. In Las Palmas, just as I had replaced the rudder rods for safety, I had renewed the lashing holding the loop together. But I had left the actual lashing to another yachtsman. I vowed that never again would I trust someone else to do a vital job for me. It took little time to fix a new lashing, but half an hour of muscle-tearing work to heave the mast into position. Tangaroa’s progress was now dogged by steering failure. Three nights later, one rudder gave way again and the crew kept short watches as she limped towards dawn. “Jutta, Jutta, come and help.” In the dark, we toiled to haul in the second broken rudder. “We must put out a sea anchor and drogues,” I explained. Jutta and I lashed a small raft of oars to the sea anchor, ballasted it with the anchor, then paid it out over the stern. This drogue helped Tangaroa’s stern to turn into the seas. We slipped off our wet clothes and climbed into the same cabin, huddled together for comfort and warmth. Next morning, the wind and seas had eased a little. I had no more long rods for the rudder, just bits of galvanized rod. Instead of one big rod, I would have to make short bolts for each individual fitting. But how, without a machine-shop and work bench? The girls had incredible faith in my ability. A man with the confidence of a loyal woman can achieve almost anything. I had two. Instead of threading a nut onto the end of the bolt to stop it dropping through the fitting, a process which would have required a machine-shop, I hacksawed notches in the end of the rod. Then I heated the notched end of the rod over the primus stove and with a cold chisel splayed the ends out. Reheating it, I hammered at the notched end to ‘burr’ it over. The end of the rod looked a little like a well-bashed wooden tent peg, but it served instead of a thread and nut to work as a rudder bolt. 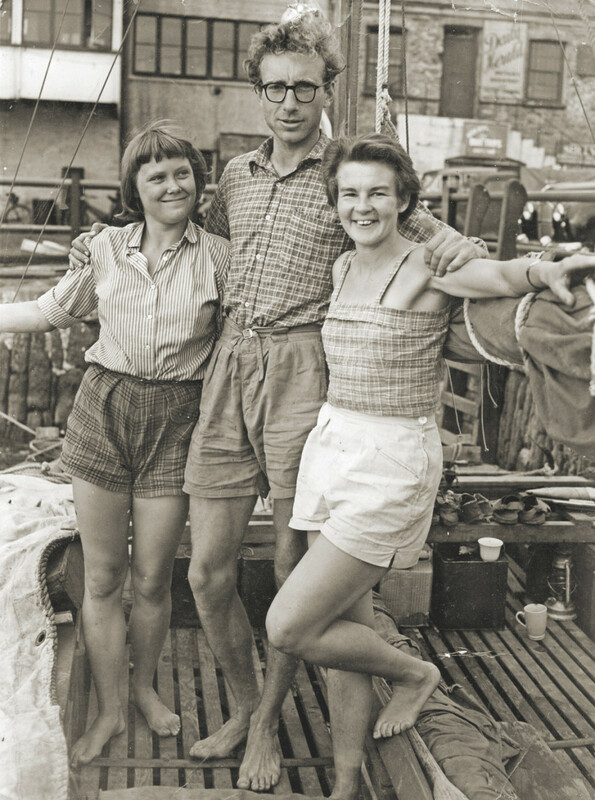 To add to my torn muscles and cut fingers, I got a few burns on that job, but with the aid of those two magnificent women, I succeeded in re-hanging the rudders, and we sailed into the third week of the voyage with 1,180 miles behind us, and slightly less than two thousand miles to go. Soon, fixing broken rudder hangings became almost a routine task. Finally, one of the blades fractured. This was cobbled up in suitably workaday fashion, but a jellyfish entered the fray and laid Wharram low with stings. The girls maintained his morale and he notes a preference for “soft kisses’”over “vinegar’”for treating jellyfish stings. Even worse problems arose when Ruth reported a leak resulting from a teredo worm infestation in one hull. Faced with this unarguable opposition, the skipper turned to and prepared a tingle out of plywood, putty and an old blanket. The girls baled fast until the bottom was almost dry. I slammed the ply-blanket-putty sandwich, putty down, over the affected area, hammered nails all around the edges and to my relief I could feel the nails bite into solid wood. I dried the wood around the patch, and mopped up the last puddle with what Jutta reported to be her best blouse. What did it matter, I thought, as I sagged against the cabin side. After this crisis, the boat sails ever onward with food growing short and nocturnal hallucinations beginning, until finally, Trinidad approaches. 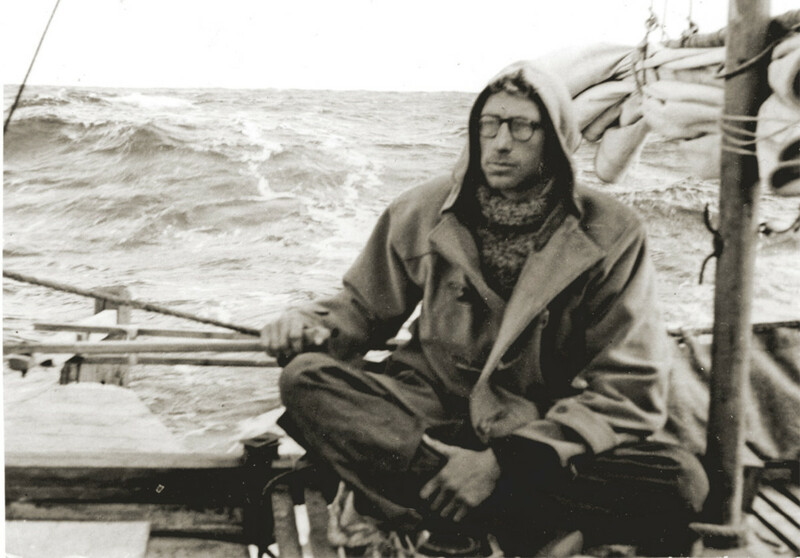 Wharram has already noted that his team are not like “ocean heroes,” but rather more parallel with early settlers discovering new worlds for themselves. His comments on his first ocean landfall tend to confirm this. On Wednesday, I was convinced I could see, with the old Polynesian method of looking for a stationary cloud at sunset, the position of land. Next day there were many seabirds, frigate birds, according to Jutta, wheeling around us. Land was near, by Atlantic crossing standards, but we were not sure precisely where it was. Ruth had been unable to pick up the BBC time pips for several days. For weeks I had wanted land at any cost and was prepared to sail the boat at the shore, crash-land it and walk off. Now I was demanding of Ruth a precise position to within five miles after nearly six weeks at sea. Working from her dead reckoning, she gave me a position that Trinidad was sixty miles ahead. My spirits soared. Then she picked up Radio Trinidad. The time given was not the precise detail of a BBC time pip, but at least accurate enough to estimate that we were 120 miles away. I was bitterly disappointed and quarreled with Ruth over her conflicting positions. Jutta stopped that unfairness on my part. With two women on board, I never had a chance. One always protected the other. When Ruth finally said that tonight we should see the lights of Galera Point at about four in the morning, I only half believed her. Jutta did. From about three in the morning, instead of sleeping, she was standing on the cabin roof. She suddenly jumped down, leapt at me at the steering position, and flung her arms around me. “Jimmy, I’ve seen it, the lights, land, land!” I left her at the tiller and called Ruth. Sure enough, there was a light blinking away. Later that day they were safely anchored. And strong they were. 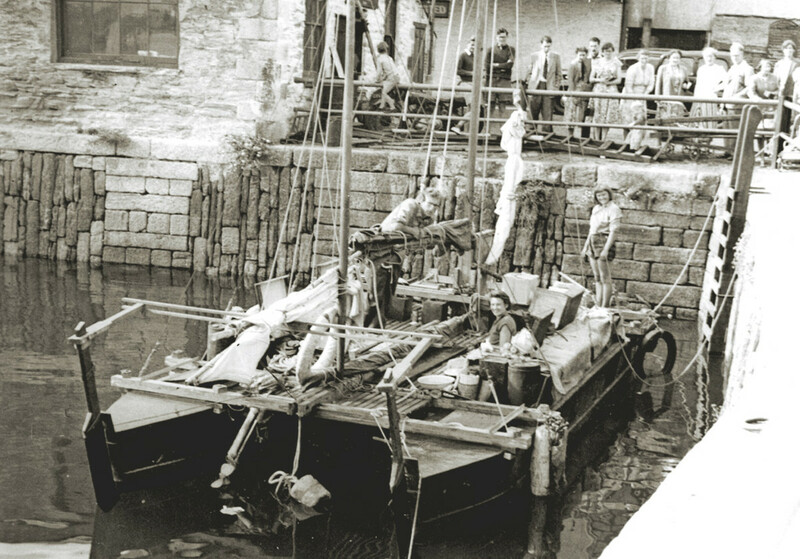 Almost 50 years on, James Wharram and his team still design and build catamarans. James remains a free spirit whose refusal to compromise with increasing bureaucracy has made many a modern sailor ponder more deeply on what really matters.